A phalanx of law enforcement chased Michael McCann into the parking lot of Hope School, whom they suspected of eluding officers the night before. The chase prompted an alarm to be broadcast across the South Coast to "shelter in place." [Update: December 20, 2018] Michael McCann, 46, of Montecito was booked into County Jail on Wednesday for felony pursuit, after being chased by Sheriff’s deputies because the vehicle he was driving resembled one they’d chased fruitlessly the night before in Summerland. Instead of stopping when a deputy hit his lights, the Sheriff’s Office stated, McCann drove into the neighborhoods near State Route 154, while Santa Barbara police, California Highway Patrol, a Sheriff’s K-9 team, and a County Air Support helicopter responded. When McCann jumped out of his car in the Hope Elementary School parking lot, an emergency alert went out across the South County since children and residences were nearby. Law enforcement believed he was armed, the press release stated, adding that a BB gun pistol was found in his vehicle. The report stated he was apprehended quickly by deputies, but the helicopter was observed hovering over the area for several hours. 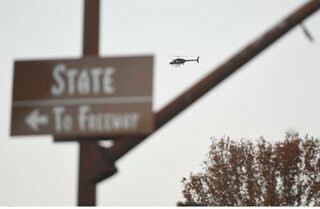 A helicopter hovered for hours during and after a late-afternoon pursuit Wednesday. An all-bulletin emergency alert that buzzed Santa Barbara cell phones at around 4:45 p.m. Wednesday afternoon is nothing to worry about, officials said soon after. The original message blared: “Pursuit ended in your area with police activity, shelter in place”. According to city officials, California Highway Patrol officers were pursuing a robbery suspect who was apprehended somewhere near Bishop Diego High School.